Greenbelt was part of a grand experiment, one of a series of planned communities launched in 1935 under the auspices of President Franklin D. Roosevelt's Resettlement Administration. From the beginning, the new development was designed to satisfy a complete range of community needs for its pioneering residents. An essential part of that concept was the development of the Center Mall, later renamed Roosevelt Center in honor of the president. The town's center accommodated space for a supermarket/ pharmacy, the original Co-op, and other basic retail shopping needs, community services and recreational facilities. 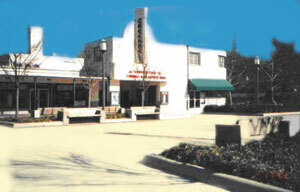 A special element of the retail center, and an important focus of the marketing study, is the town's movie theater, known today as the Old Greenbelt Theatre. The gala opening of the cinema in September, 1938, an event captured in a vintage photograph hanging in the theater's lobby, was a milestone event in the development of the new town. The theater, which had "gone dark" for a number of years, is again operating, showing "first run" films a few weeks after their initial release. But, as a single screen theater competing against its many multiplex competitors, the finances of the Old Greenbelt have been precarious. Roosevelt Center is more than just another shopping center among many choices available to consumers in Prince George's County. The buildings, shops, services, theater and other community gathering places form an important part of Greenbelt's heritage. This was officially recognized in 1980 when the historic district of Greenbelt, including the center mall, was placed on the National Register of Historic Places. Josef Nathanson, the consulting group’s president, led the UIA team for the Greenbelt assignment, which included retail market specialists and a business advisor who had previously developed financial plans to enhance the economic viability of the historic Senator Theatre in Baltimore. The Roosevelt Center market study included a series of meetings with the center's merchants and representatives of the community's arts and cultural organizations; a shopper's survey to determine current Greenbelt consumer preferences and shopping patterns; an economic/ demographic analysis of the primary market area; alternative business models for the Old Greenbelt Theatre; and marketing strategies to enhance the competitiveness of the entire retail center.